Ken Wilber is the author of more than twenty books. The Spectrum of Consciousness, written when he was twenty three years old established him as perhaps the most comprehensive philosophical thinker of our times. Credited with developing a unified field theory of consciousness--a synthesis and interpretation of the world's great psychological, philosophical, and spiritual traditions-- Ken Wilber is the most cogent and penetrating voice in the recent emergence of a uniquely American wisdom. A message from Ken Wilber on the Integral Institute. 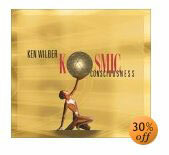 "The Collected Works of Ken Wilber"
Kosmic Consciousness - Ken Wilber - 10 Audio CD'S, over 12 hours. CD Description... "Just who is Ken Wilber?" For more than 30 years, a rising tide of readers enthralled by this visionary philosophers map of human potential have asked this question about the famously "low profile" author. Finally, early this year, Wilberthe author of A Brief History of Everything and Grace and Gritagreed to create a series of in-depth dialogues on audio for the first time ever. The result is Kosmic Consciousness: a landmark recording that invites us to experience a full-length audio learning course with this celebrated thinker. Listeners will be surprised and delighted to discover the Ken Wilber behind the writers penspontaneous, irreverent, and incredibly passionate about how each of us can participate in the unfolding of human consciousness. Through over 12 hours of revelatory insights, Kosmic Consciousness explores: The integral map of the Kosmos (the universe that includes the physical cosmos as well as the realms of consciousness and Spirit), the pursuit of the Good, the True, and the Beautiful, discovering your "multiple intelligences", using altered states, male and female sexuality, how meditation accelerates personal growth, prayer, does it work?, integral perspectives on individuals spanning Jung to Piaget, Baryshnikov to Nietzsche, Jesus to the Buddha, and much more. Amazon.com- Reviewer: I've long read and long loved Ken Wilber's writings, but I had always wondered: really, who is the guy? What is he like? What motivates him? This is an excellent interview -- not your usual fare, but for the fan of Ken Wilber, or anyone who wants to hear what this world class genius sounds like and feels like, this is a great product. 13. Now You've Done It! 2. wake Up to Nirvana! 14. Which Practice for You?